Here's my June column for AVENUE magazine. Photography this month is by Eve Kazan. It’s that time of year again where we put aside momentarily our grumbles about lag, TPV clauses and the whimsy of online relationships and pat Second Life® on the back once more for incrementing its existence by another year. Yes, SL is nine; one more year to go to the almighty decade, provided a Mayan prophesy doesn’t come along between now and then and ruin things for everybody. Bloody Mayans. They clearly had far too much time on their hands. Assuming, then, that we do indeed make it to this momentous occasion, the likelihood is that the blogosphere will use the moment to make a few prophecies of its own. What will SL be like on its twentieth birthday? Will there be a twentieth birthday? I’ve decided to jump the gun on everyone and begin that speculation now. After all, if the blogosphere is right, there might not even be a tenth birthday, and that would be an opportunity for carefree, utterly-without-evidence speculation lost. In fact, I’m going to ignore SL completely in my 2023 visualisation. Let’s just say, “What might the metaverse look like on SL’s twentieth anniversary?” Whether or not SL is going to still be around to fill that role by then, I confess I have absolutely no idea. But I do believe (Mayan prophecies and other non-branded end-of-world predictions aside) there will be a metaverse of some description around at that time. I can’t actually imagine how it could be otherwise. Online 3D gaming is enormous. Social networking is enormous. The desire to exist beyond that which physically surrounds us is as great as it’s ever been. It really is only a matter of time before these things converge on a large scale, and if SL hasn’t captured so far – and doesn’t ultimately end up capturing – a mass market on the concept, I suspect this will only be viewed in retrospect as an attempt at an idea that failed because it was just too ahead of its time and didn’t quite get the finer details right. A bit like the Sinclair C5. So the 2023 metaverse I’m imagining is immensely popular. Gone are the days of snickering at the guy who let it slip he had an avatar in ‘Second Life’ and residents no longer have to fight the desire to respond to such poorly concealed mirth by smashing people’s faces in. It’s now pretty much accepted, in fact, that metaverse activity and trade is the new direction for online time – much as Facebook is accepted today – and the only poorly concealed smirks to be found are those of the smug, old-timer metaversians privately giving each other gleeful high-fives each time a real life work colleague asks discreetly for tips on managing inventory or cybersex technique. How has this been achieved? Improvements in technology have, of course, helped. That all-important ‘first hour’ is now smooth and slick and satisfactory. Super-fast broadband speeds of 100Mb or more have reduced lag to hardly noticeable in all but the most crowded of regions. Large screen displays offering life-size avatars; photo-realistic environments, simulated down to the smallest blade of grass; cameras that watch your real life body for movements that can be mapped onto your avatar: all these things make immersion more complete and more immediate than it’s ever been before. 3D immersion glasses also have a following, but the tabloids have had a field day with research linking them to headaches and occasional epileptic seizures. 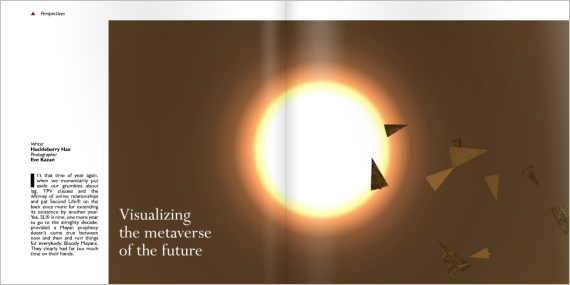 It’s not at all the technology that’s had the biggest impact on mass take-up, however: the metaverse’s redesign is acknowledged as being largely responsible for that. In the end, all it took was for someone to look at successful social media and actually apply what had been learned there to what had been learned in virtual worlds like SL. For example, there were certain things that most new Facebook users ‘got’, even before they’d logged on to the network for the very first time; the most powerful of these was the understanding that everyone on Facebook had their own space where you could find out things about them. In the 2D world of the web this space was understood to be a web page. In the 3D world of the metaverse, therefore, it was realised that the intuitive expectation had to be that this space would be a room or a building or a garden or some sort of three dimensional place that represented in some customisable way the person it belonged to. In the new, successful, metaverse, then, signup takes you straight to your very own place. For free. The notion that having any sort of a home is a luxury residents should pay for has been identified as an unworkable business model; instead, everyone gets a free place of a certain size and money is required to make it bigger. You start off with a default house and small garden that you can customise to your heart’s content and if you want a bigger area, then you pay. Simple. And if you want your own space to be something promotional whilst you rent to actually live in someone else’s space (or have residences in a number of different spaces) then that is just fine too. It’s no longer a single cyber-world, then, as SL was. But SL was never really a single world in any case. Few people actually walked or flew from region to region in the days of SL; teleportation was, of course, the norm – and, in the case of private sims, essential. Naturally, you can still teleport from place to place in metaverse 2023 – let’s call it ‘Huckverse’ for future retrospective patenting purposes – it’s just that the old pretence of a single world has been dropped. If you have the money, you can extend your own space into an entire planet if you want to, or you can link your space to the spaces of your friends and make one up between you. Linking spaces, in 2023, has become the modern day equivalent of friending. Did I mention that all these spaces are accessed via a web page? Of course they are; why would anyone in their right mind ignore the number one infrastructure in use for accessing the internet (why indeed; why indeed)? But Google Lively lasted for just six months. Because what it was was an attempt to apply that which made social networking successful to a 3D environment which completely ignored that which made virtual worlds successful. What seems to be ignored by the ever-searching eye of IT hunger is that Second Life is a successful venture. Where it hasn’t succeeded so far is in achieving mass-appeal, but where it has succeeded – and spectacularly – is in the retention and creativity of residents who do become immersed in it. Once you get past those first few awkward hours that are such a turn-off to so many, the time and talent invested by residents in SL becomes very considerable. Any serious strategic consideration of a mass-appeal metaverse, therefore, has to consider not just what makes people sign up in the first place, but the things that make them want to stay once they’re in. Google Lively was just a 3D chat-room with a few frills – not massively different from Microsoft’s ‘Comic Chat’ in 1996 (also discontinued). Customisation of your room and avatar was extremely limited and making new content was nothing like as easy or as comprehensive as it is in SL. There was very little sense of immersion. The graphical look was very cartoonish. Navigation controls were fiddly and non-intuitive. Basically, it sucked. Huckverse, then, will combine social networking expectations with all those features we know and love in SL – and just know that others would love if they ever gave SL a proper chance. User content creation will form the basis of a thriving online economy (an economy which, incidentally, is not limited to the metaverse alone – you’ll be able to spend your Lindens earned on Amazon or iTunes, for example) and more tightly interlinked with real life products (clothing manufacture, for example, will adopt the principles of current print-on-demand technology, enabling people to design clothes for avatars which can also be bought in the real world). Inworld events and experiences will be regarded as real and tangible and worthwhile pursuits. Online relationships will be attended to by some as the biggest threat there’s ever been to conventional life and by others as the beginning of a new understanding of human interaction and love (although psychologists probably won’t get around to studying it seriously until about 2053). And so on. My dearest hope is that Metaverse 2023 will in fact be SL. On that issue, we shall just have to wait and see if Linden’s imagination and courage is up to the task. For the moment, however, such fancies can be put aside. Nine years is quite an achievement, regardless. Happy Birthday, Second Life.